Unlock some of nature’s magical secrets on a Spring Low Tide Coasteering adventure with Newquay Activity Centre in Cornwall. The precise alignment of the sun and moon happens twice a month, creating massive spring tides that cause the sea to recede further than usual. These phenomena reveal fascinating living creatures along the shoreline that are usually much harder or impossible to find. What is a Low Tide Coasteer? If you’re interested in ecology and extreme sports, this bi-monthly phenomenon is not to be missed. 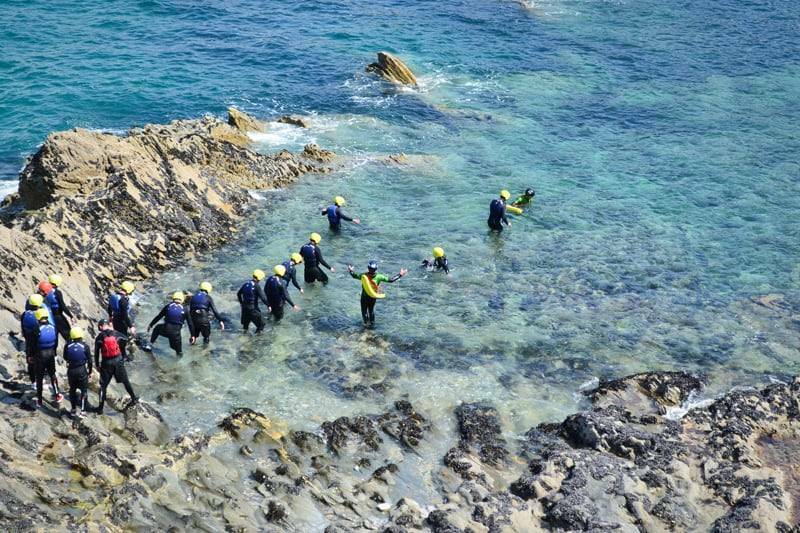 You’ll get kitted out in a wetsuit, a buoyancy aid and helmet before negotiating a route with one of our highly qualified and animated coasteering leaders. Together you’ll uncover amazing marine animals from amongst the craggy rocks. Our Spring Low Tide Coasteer is great for school groups, families and anyone wishing to learn more about the ocean environment in Cornwall. You will not only come away with a wealth of marine knowledge but you’ll also have learnt how to wild swim, traverse craggy cliffs and rock pools and negotiate your way through caves, sluices, natural rapids and wash channels. But don’t despair if this sounds too extreme, you can gauge the level of intensity. There is always an alternative route and our highly trained instructors pride themselves on giving you the best day out ever. With such a balance of adrenaline and education, the Spring Low Tide Coasteer offers something for everyone. Our low tide coasteers are an exploration of the craggy intertidal zone along the shoreline, so you will need to bring a pair of lace-up shoes with hard soles. Old trainers that fit you well will be perfect. If you don’t have a pair, we can provide trainers for a small hire charge. Remember to bring some swimwear for under you wetsuit and a towel for afterwards! To find out more, check out our ultimate guide to coasteering. Why not add a coasteering photography package to your coasteering adventure? All the thrills and spills captured for you to keep forever! Our reviews on Tripadvisor for Coastering at the NAC rank us as number one for Cornwall activities and we’re proud golden winners of the Cornish Tourism awards. Our Spring Low Tide coasteers are unique to Newquay activity Centre and will show you the beauty of our coastline’s natural environment! Comprehensive instruction on correct techniques for traversing, jumping and water entry / exits.